Please respond by email to programs@womenqc.com. Saturday, October 21 from 9:00 to 11:00 a.m.
2045 E. Quail Crossing Blvd. Hopefully you have finished going through your closets and cupboards for those special items that will be a “gift of hope” to some very special veterans. Come see us Saturday morning with your donations. Volunteers will be there to help unload your vehicle. Turn onto N. Oak Hill Lane, drive around the back of the CATC building and follow the road to our entrance. Questions, contact: Laura Colbert at clothingdrive@womenqc.com or 625-4033. We are down to the last week for purchasing tickets for the brunch. The last date you may purchase your seat is the 22nd of October. There are just a few seats available so please make your arrangements today. Tickets are $10.00 for members and $20.00 for first time guests. If you are purchasing for multiple persons please have the names of each person when you pay. Please contact Nancy Jacobs at (970) 946-3910 to reserve your seat(s). Brunch Menu: Egg salad filled croissant, melon salad and an apple crumb cupcake with goblin glaze. The special drink will be a Black Russian with spider on the side. If you choose, you may wear a costume, or wear your black and orange as it’s the Halloween season. Our semi-annual collection for the Green Valley-Amado Food Bank will take place on October 30, the day of our brunch. You may place your donations in the bin outside the Ballroom. Besides food items, the Food Bank really appreciates cleaning, paper, and hygiene products. No time to shop? Cash, checks, and credit card donations as well as gift cards are always welcomed. and dance to the music of the Bouncing Czechs. And yes, they will play other than polkas! To buy a ticket, contact 207-6188 or pastpresident@womenqc.com. The last opportunity to buy tickets will be at the Beer Talk on October 23rd. Cash or checks only. Come hear a talk on The Art of Craft Beer on October 23 at 7:00 p.m. in the Ballroom. You will not get to taste beer at this lecture—that’s reserved for the Oktoberfest. But you will learn what distinguishes craft beer from the mass-produced variety. We will be selling tickets for both the 50-50 raffle and the gift basket raffle starting at 6:00 p.m. on October 23 in the hallway. We recommend you buy your tickets early so that you can fill them out ahead of time. Or you might consider bringing some address labels with you. Cash or checks only please. The green totes with gold quail have arrived. They will go on sale at the Brunch on October 30 but if you need one or more before then, please contact pastpresident@womenqc.com or 207-6188 and she will make them available. Cost is $7 each or 3 for $20. 2018 Applications for new members and renewals for current members will be available at the October 30 Brunch or you may go directly to the website to complete the Membership Application Form. You may bring your renewal to the brunch, mail to Angie Werner, 1924 E. Orinda Lane, or place in the Women of Quail Creek box at Angie’s front door. Remember to come to the October 30 Membership Brunch photo-ready and your headshot will be added to the photo book of paid members for 2018. If you haven’t seen it, access this link to the Member Photo Book. 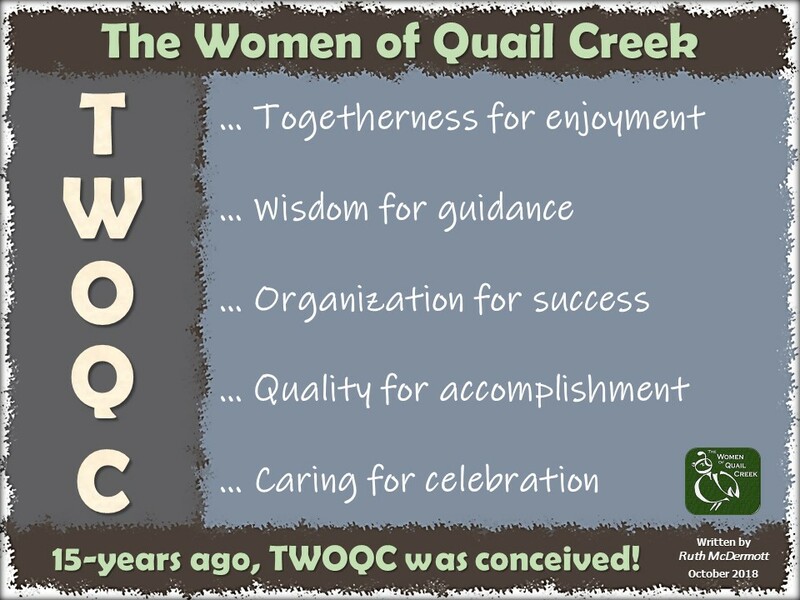 This entry was posted in Announcements and tagged carol mutter president, quail creek country club, the women of quail creek, twoqc facebook. Bookmark the permalink.